inkedIn began as a professional networking site, has evolved into a social media behemoth, and has yet managed to maintain and sharpen its focus on the professional space. That may, in part, explain why, in 2016, Microsoft chose to put down more than $26 billion Washingtons to buy LinkedIn. While both LinkedIn's web site and mobile app have undergone substantial changes over the years, and is a far cry from the spartan look both sported just a few years ago, I wanted to call out one peculiarity - call it eccentricity - that the site has. I would call it a glaring UX and product management miss, if you will. 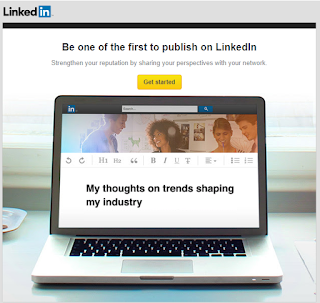 email from LinkedIn in June 2014, announcing the launch of the publish feature. Sometime in April 2014, LinkedIn introduced a feature that allowed users - by invitation at first, and everyone later - to publish their articles on LinkedIn. This feature is now a great source of user-generated content for LinkedIn, helping drive more traffic to its website. I have written a few over the last couple of years, and it's a great way to my thoughts on relevant topics in front of a relevant audience. But Where Are My Articles? 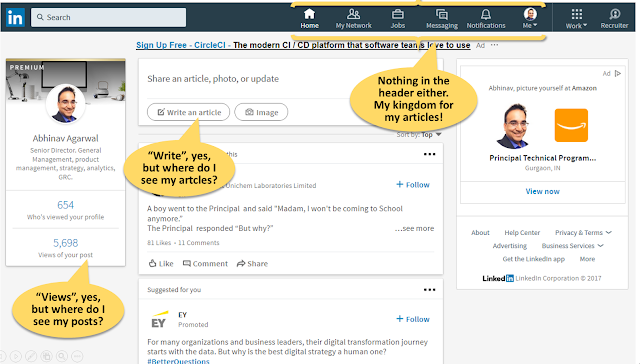 From the LinkedIn home page, try finding a way to navigate to your articles - published or in draft mode. Go ahead, I will wait while you wander on the home page. Let me show. See the screenshot below. That is the home page I see when I go to LinkedIn. The menu at the top contains no links to go to my articles. I can click the 'Write an article' button and it will take me to the LinkedIn Publishing page, and I can start penning pristine prose there. I can click the headline and view analytics on my articles or shares. But I still cannot view a list of my articles. I can't. If I go to the Publishing page, and if I click the 'More' dropdown, then voila, I can see that I have finally found what I was looking for. So will you too. Why? Why make it so darn tough to find your own articles? Oversight? Likely. A miss, from both product management and UX. Why is an important features such as this so difficult to find? It is not even available from the home page. Why is not anyone talking about discoverability? What about the scent of information? Nielsen, Cooper, Pirolli, anyone? © 2017, Abhinav Agarwal. All rights reserved.